Making beads, necklaces, sculpture, miniatures and making dolls are ongoing projects here along with all sorts of other media work, including these web pages detailing it all. 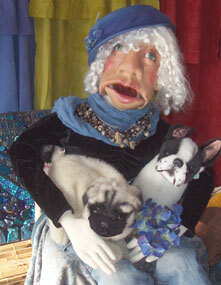 Aunt Acid is a polymer clay headed puppet with a cloth body. She wears polymer clay accessories too, of course, and hand dyed clothing along with vintage bits and pieces. Read more about her at her website, which is also a work in progress! In the process of putting together The Aunt Acid Show we are building mosaic sets and props, dyeing curtains and costumes, and getting all sorts of stuff and nonsense to come together in new ways. It’s a project that is going to have many sub-parts, and so takes a long time to bring it all together. Here are some tutorials I did for Sculpey, including one for making decorative Faux Cinnabar items.Another uses polaroid or school photos to make unique and beautiful ornaments! Covering eggs and decorating them with polymer clay is fun and the results are beautiful!Learn how to easily empty and prepare the eggs and decorate them. Decorative filigree cut-away is a great technique to use with mica bearing clays. Use polymer clay to make Holiday Ornaments using cookie cutters! It is so much fun to decorate holiday cookies–its even better when you make them out of polymer clay, and can enjoy them for years to come! This featured project can be done with other shapes as well as the bears and stars that are shown. It is also a good idea to have a separate batch of cutters to use for clays, and to keep the food and clay tools separate. Although polymer clays ARE certified non-toxic, being careful is always a good thing when dealing with art supplies of any sort. You don’t want anyone to get baked clay in their next bite of cookie. 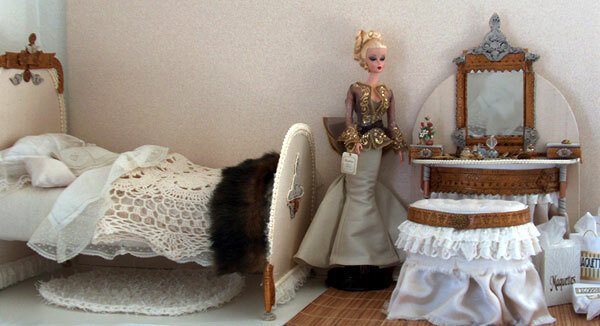 Miniature dioramas and doll furnishings like the mini bedroom set make great use of polymer clay for decorative details when used with all sorts of different techniques. 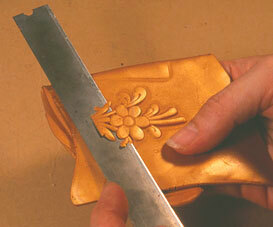 Rubber stamps and molds let you bring a lot of detail into this kind of work. 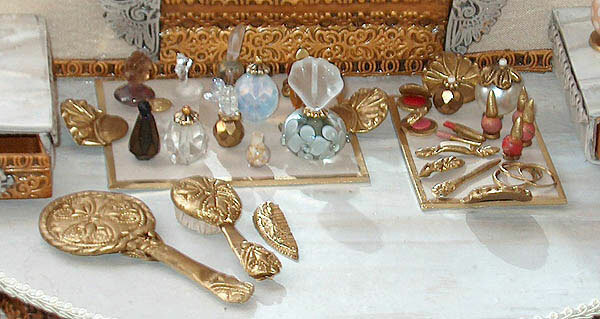 The set shown here uses polymer clay to mimic wood, ivory, marble and more. The vanity set seen here is also made of polymer clay, and there is now a PDF how-to available for purchase at etsy. Here’s a tutorial on painting cloth faces onto canvas bags, or for use on dolls!Its the same sort of face I draw onto my paper dolls and my cloth dolls.I like making dolls of all sorts, cloth, polymer clay, ceramics, and paper. Here’s a free downloadable PDF that includes a pattern I’ve designed for making Spirit Dolls like the fiery one seen at right using the materials of your choice for the body. As the designer of this pattern, I hold copyright and I give users permission to use it for their own pleasure or to sell their creations–but NOT to resell the pattern. Read more about copyrights and wrongs here! 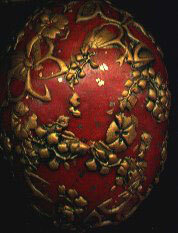 The simple pattern can be enlarged or reduced as you choose. 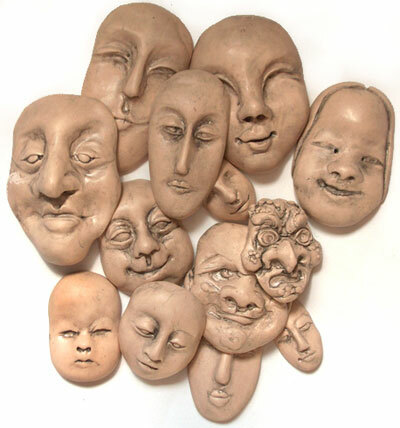 I like to use the polymer clay faces or ceramic faces that I make. I put them together with dyed cottons and silks as well as other bits of ribbons and sequins and package them as Spirit Doll Kits. Look for more of them to be available this Spring through our Etsy store, including new versions with ceramic faces, buttons, and hand dyed fabric and ribbons. Spirit Dolls can be made of all sorts of materials including of hand dyed cloth and sewn from your own or other patterns, or pre-made bodies that are commercially available can be dyed, painted, beaded and embellished in countless ways. They can be made in all sizes and styles, however you want them to look is completely between you and the doll! I’m also selling supplies for you to use in your projects. These are some of the items currently available in our storefront at Etsy where we have mosaic tiles, faces, beads and other items there for purchase. Etsy.com is an online artisans’ venue where handmade and vintage items are featured. for purchase. Check back to see what comes up next as we get ready for Spring! The picture at left shows some of the the face cabochon styles that you can now purchase and use in your doll and wearable art projects. Making your own faces is a lot of fun, as any kid knows! 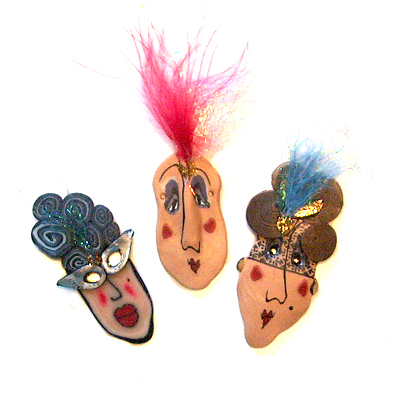 Make face cabochons for decorating boxes, wall hangings, wearable art–and dolls! 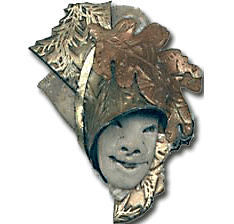 You can costume and style a face in lots of different ways.To put together this red hot Red Hat wall hanging, you start with sculpting the face, and then dress it up. 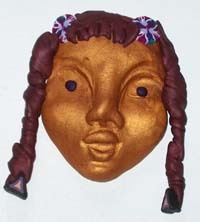 This tutorial starts you out with step by step instructions on sculptinga face using scrap polymer clay. Make replication a breeze with easy to use silicone RTV rubber or other mold materials. Make faces or make texture sheets and use them to dress up the faces with this fun filled project. You can see more miniature masks from the 2011 Annual Miniature Mask Swap by clicking here.We’ve been doing this somewhat-annual event for more than a decade now. More than 30 artists participated in the creation of the masks shown on the gallery page for the 2011 season.All of the masks are sized to fit inside a three inch square. Swaps are a great way to build collections and to participate in group art! View all of the miniature masks made by Columbine Elementary School Students and Staff in the Artist In Residence Project “Best Faces Forward”. This installation of pictures of the over 200 masks and a garden of polymer clay flowers was created by all the students (K-5) and staff with the assistance of the resident art teachers.